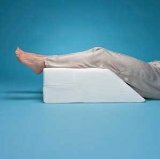 Elevating leg rests, or elevating foam wedges, as they are also known are cushions that are designed to improve circulation while also decreasing lower back pain by promoting proper spinal alignment (Source). These elevating pillows work by accommodating the natural curvature of your coccyx and lower spine (Source). Circulation is enhanced by elevating the ankles and feet above the heart level. Let’s take a look at some of our favorite elevating leg cushions. Most of these elevating leg rests are ‘wedges’, while the ProCare is more of a ‘turret’ style that accommodates a single leg in a sort of vertical sling rest. Is an elevating leg rest right for you? One user who had edema on their ankles and feet and was also experiencing leg swelling experienced significant improvements in her condition. Another reviewer writes of having spent $80 for an inferior product at a medical supply store before checking Amazon and discovering a higher quality alternative. Another reviewer writes of having had bunion surgery on one of their feet. She purchased an elevating leg cushion and used it for over four weeks, day and night, to help with the swelling that she was experiencing after surgery. It is slightly difficult to use under covers because you will not be able to pull the covers down over your feet comfortably. One user writes of draping a blanket over herself and keeping her feet slightly exposed as a workaround alternative. Yet another reviewer writes of experiencing significant decreases in chronic back pain as a result of using an elevating leg cushion. Another benefit that users consistently rated highly is the removable covers that allow you to keep your elevating leg rest cushion clean. If you are particularly tall, you will want to investigate the exact measurements of the elevating leg rest to ensure that you purchase one that is the right fit for your personal requirements. 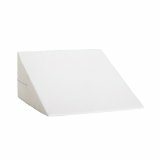 Another reviewer who was recovering from reconstructive foot surgery enjoyed the free shipping and quality packaging from Amazon-and she reported decreases in pain as well as knee pressure from using a quality foam wedge. 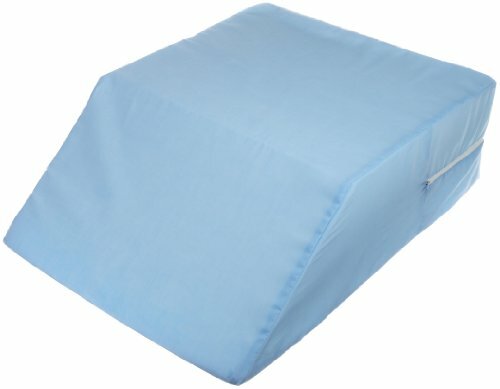 Many users write of using these pillows and wedges to decrease pain symptoms and increase speed of recovery after operations. Many of the users that we surveyed described using these pillow wedges to treat symptoms like pressure, pain, swelling, muscle tension that occurred in their extremities and even lower back. 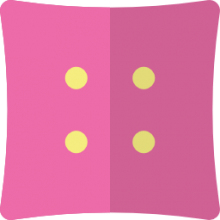 Reviewers were also positively impressed by the memory foam material that many of the cushions and wedges use- it is able to comfortably conform to their bodies’ shape. One of the common frustrations that occurs post-surgery is that existing pillows are inadequate for providing needed support. Users describe loading their bed with all sorts of pillows and blankets to get the desired elevation, but eventually realize that it’s best just to purchase a quality medical-great product online and save themselves a lot of pain and hassle. One user who wrote that he did not enjoy sleeping all night with the elevating bed wedge rest found that he experienced a great deal of relief using it for just several hours a day. In the event that the elevating leg cushion rest was a little too short-users were able to prop their feet that were hanging over the edge with other cushions, providing them enough relief while maintaining the medical benefits of the elevating leg rest. One evident drawback of elevating leg rests is that they are not able to accommodate side sleepers. Reviewers write that over time you can get used to sleeping on your back, but there are still benefits to using this cushion intermittently. One user did write that they use their leg cushion while on their side, but this is not an ideal orientation for your body. If you are recovering from a lower extremity surgery, and your doctor advises you to purchase one of these products, it’s probably a good idea to do so. They are proven to help in your recovery also indicated for a variety of other health and medical conditions, particularly when it comes to disorders that cause swelling and circulation issues. Our best advice is to read our elevating leg cushion reviews on this page and then to check out the Amazon product pages to read some of the reviews written by users covering from surgery who have experienced recovery benefits from their use.